Every month my husband and I sit down for our monthly budget meeting. Is it fun? Nope. Do I look forward to it? Big no! Do I do it anyways because I know it will save me money and I love to save money???? Absolutely! The monthly budget meeting is the time for us to discuss the previous months budget. We go over what worked, what didn’t work and we put together a budget for the new month. Our budget is a zero based budget, meaning every single penny that comes in during the month is budgeted to a certain category. There is no excess. This not only helps keep us on track, but it also means we have to stick to what was budgeted, no exceptions! We try to brainstorm every expense that is likely to arise over the next month. Sometimes, we forget something….or other times expenses that we had no way to plan for happen. Take last month for example. We had our budget meeting and thought we were entering the month prepared. A couple of week later we found out that we were going to have to pay $120 for my daughter to participate in track. We had already agreed that she would be allowed to do track this year, we just didn’t realize how soon that fee would be due. So, we went back to our budget and made it work. We were able to cut a few other expenses down in a different category so that we could come up with the $120. We have done this enough times that it’s become very easy and low stress. It is so so so important to always have an Emergency Fund in place. I can not stress this fact enough. Emergencies will arise! Now, my daughter participating in track is not categorized as an emergency, but other unexpected expenses might be! It’s not fun to think about the emergencies that might happen, but it’s necessary. I’ve shared before about how difficult it was for our family when my husband unexpectedly lost his job. It was awful. But. The one thing that kept us going and kept me calm was the fact that we had an emergency fund in place. That fund gave me the assurance that we would be ok. It can be hard to want to grow your emergency fund, especially when you have dozens of bills to pay, retirement to save for, mouths to feed, debt to pay off, and a life to live….I get it! If you’re struggling getting an emergency fund, start small. Try saving just 2% of each paycheck. As it gets easier to do, slowly increase that percentage. Also, set up a direct deposit so that the money is automatically deposited into your emergency savings account. This way you don’t even have the choice to use that money for anything else. If you never even see it, than you won’t even miss it! Make sure you have a “miscellaneous category” included in your monthly budget. We put $150 into miscellaneous each month. This money is used for all of the situations that arise, but weren’t planned for. When my daughter came to us with the information that it was time to pay for track, we knew we could cover it with our miscellaneous budget. However, we also knew that we would need to watch our spending in the other areas to make sure that no other “miscellaneous” items arose. Put a pause on all unnecessary spending for the rest of the month. This may include items like going out to eat, clothing, groceries (try a pantry challenge), entertainment, etc. This is not an easy adjustment, but remember it will be temporary. Many times the spending freeze will only need to be for the rest of the week, and then you can start fresh the next month with a new budget. Oh how I love a fresh new budget! If you need some quick cash, consider selling a few items around your house. 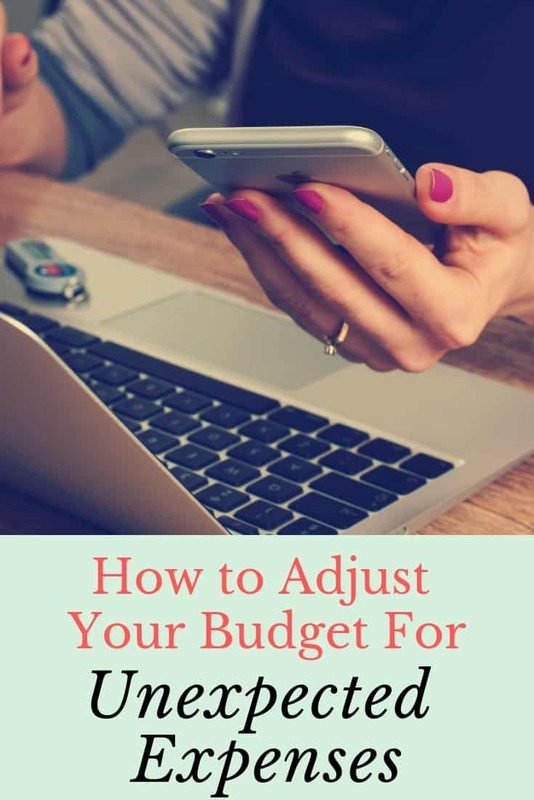 This is actually my FAVE way to fix the budget (I love making money…I got it from my father 😉 ). All it takes is 5 minutes of taking pictures and writing a brief description of whatever you need to sell, and bam! You’ve made money! Here are 5 Websites you Can Sell Your Stuff for Quick Cash. Most importantly is that you don’t let the unexpected expenses discourage you from your big goals. There will always be bumps in the road, financial goals will never ever be easy and smooth. But, you can overcome them. I promise! No budget is perfect. Mine certainly isn’t! But. I keep trying every month to improve little by little. Learn from each mistake and you will find every hurdle you come to will become easier and easier to cross. How do you deal with unexpected expenses in your budget??? Do you have any secrets that have worked well for you? great post! I completely agree with the monthly budget meeting, I do not find it one bit fun.